Design ideas for a pool you'll want to dive right into. A backyard pool can be more than just a spot to cool off in the hot St. Louis summers. These days, pool designs add interest and drama to your yard. The options are limitless, but depending on the site conditions of your yard, such as the grade and elevation, certain pool features may lend themselves well to your space. SLHL is skimming the surface on design concepts to turn your concrete pond dreams into an outdoor oasis. 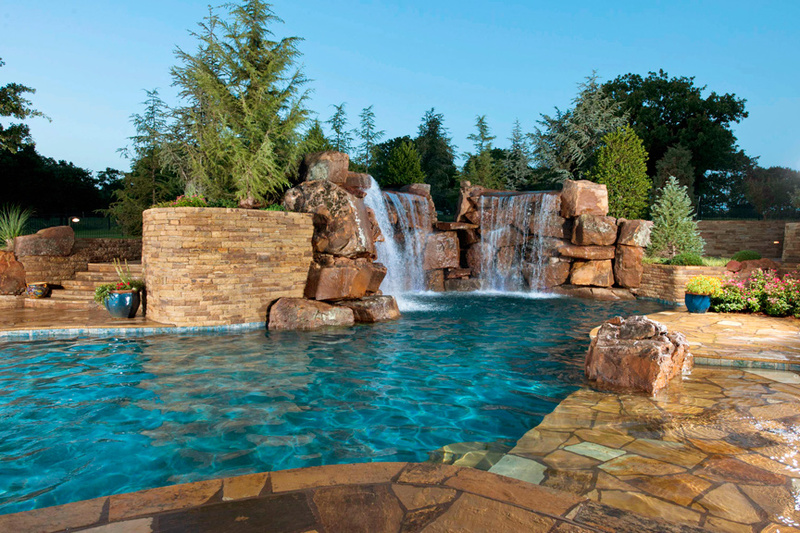 To add additional interest and beauty to your backyard, consider adding a water feature such as a waterfall or fountain to your pool. Not only do they look natural, the waterfalls produce sounds that can block out city or suburban noise. Negative/infinity edge pools create a dramatic effect in your backyard. A negative or infinity edge pool produces the visual effect that the water is extending to the horizon. This type of pool is ideal for a yard with a long, expansive view. “If the grade of the yard falls away from the house, this creates an opportunity for a negative edge pool with a lower catch basin,” says Bret Wood, director of design at West Port Pools. A beach entry pool features a deck that gently slopes beneath the surface of the water, becoming increasingly deep as your move forward much like walking into the ocean waves. These pool entries are ideal for homeowners with young children, handicapped individuals or senior citizens. They allow the swimmer to enter the pool without having to use stairs or a ladder. “A beach pool entry will make the pool length larger because of the slope from deck level down into the pool,” explains Bret Wood, West Port Pools.